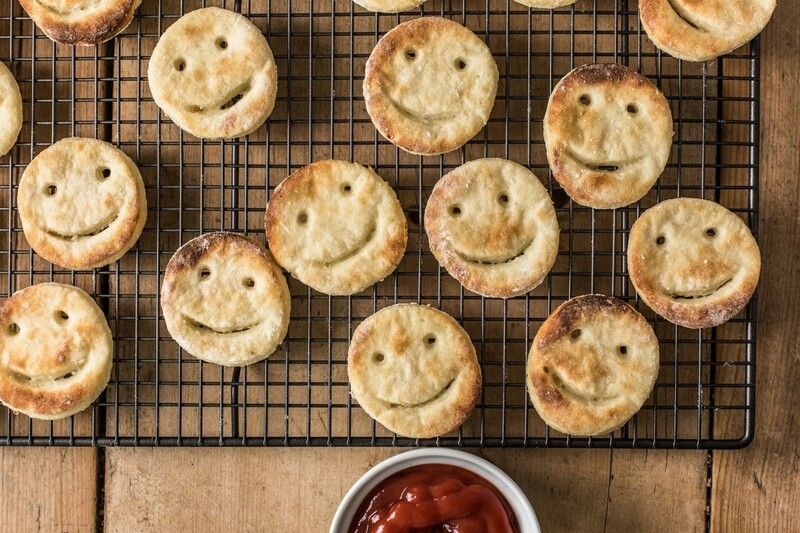 A recreation of the classic school favourite, these potato smiley faces are the perfect comfort food without the added guilt. 1Peel and boil the potatoes until soft. Mash and place in a bowl. 2Combine the salt with the breadcrumbs and add to the mash. 3Add the beaten egg and mix through to form a very wet dough. 4Sieve in the flour and cornflour and use your hands to form a dough. If it is too wet add a little more flour. 5Cover and place in the fridge for 30 mins or longer. Dough can be made in advance and kept in fridge until required. 6Pre-heat oven to 180 ˚C. 7Place a sheet of baking paper on a board and sprinkle a generous amount of flour on it. Roll out the dough to the thickness of a pound coin. 8Using a round cookie cutter, cut out the circles and place on a baking tray lined with baking paper. 9Use a straw to make the holes for the eyes and a tbsp to make the mouth. 10Place in the pre-heated oven for 20-25 minutes or until cooked. 11Use different shaped cookie cutters (i.e. christmas trees and stars) for various festive seasons. This easy-to-make side dish really completes a meal.